In the past few days I have received some exciting looking mail art and rather than keep those of you who sent it wondering if it has arrived, I thought I'd give you a sneak preview so I don't panic. That last word is a little insight into me - the thing that really bugs me, gets me worried is thinking that I am letting people down, so HELLO: Alzira Liliana Renata Zelinda, Sticker Dude (Joel S Cohen), Eileen Richards, Elaine Elliot and Earl Soham School, Susan McAllister, Artist in Seine, and Herman Kamphuis, I GOT YOUR MAIL! 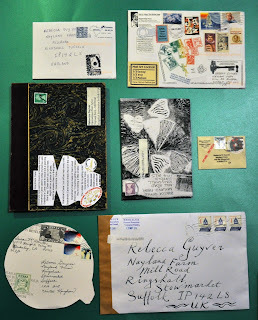 I also got a radiogram from Marie that (for some reason) isn't in my blogging pile so it's not photographed but I WILL FIND IT and be blogging all this wonderful mail soon. On Sunday I became the proud recipient of a new motherboard. Of course I still needed to download an operating system and fix some glitches in my email, post surgery, so I am a little behind with everything including chitting my potatoes!